This is a rare ancient Roman silver Miliarense of emperor Constantius II struck between 350 - 355 A.D.
VIRTVS EXERCITVS soldier standing, head left, holding spear and shield. 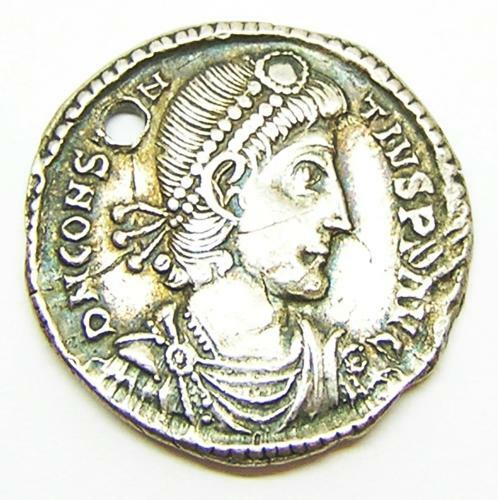 This coin would grade around EF and has been sold as such, however, it has a piercing likely made during the late Roman or Saxon period (to make the large coin into a pendant/piece of jewellery). The position of the piercing will enable the hole to be filled or repaired quite easily. The piercing is part of its history and will be sold as such. DATE: 350 - 355 A.D.
ATTRIBUTION: RIC VIII 160/203 / Sear 17884.